Even though we’ve been out of school for a while now and there’s no official summer break anymore, there’s still something about the warm weather and longer days that feels like a nice excuse for some good old fashion summer fun. This time of year makes us yearn for beach days, crave popsicles, and feel especially nostalgic for summer camp. So in the spirit of summer, we decided to host a girls’ get-together last week. One of our Team LC editors had us over to spend summer break like we used to—enjoying some time outdoors and indulging in some arts and crafts. 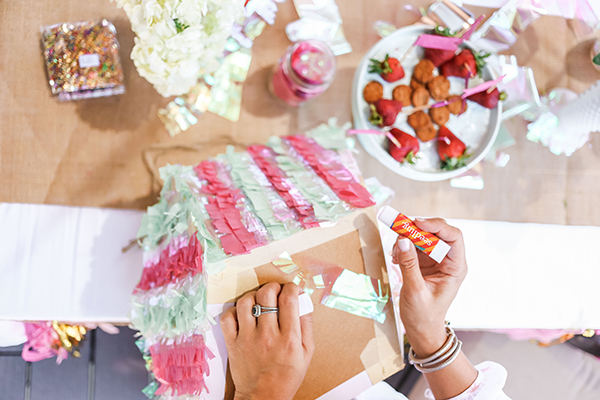 In our opinion, decorating is one of the most fun parts of hosting a party. Even a few simple touches can help to get everyone in a festive mood. 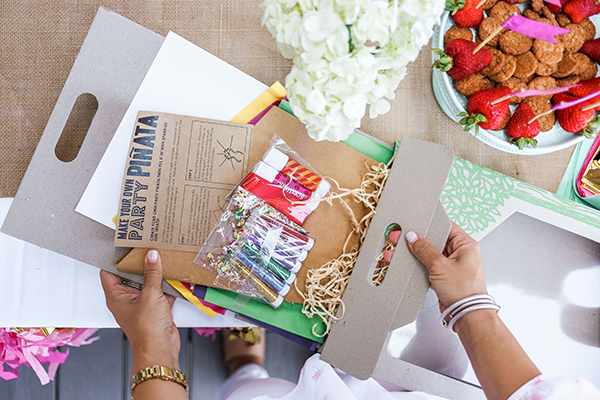 In addition to cute toys and activity kits, Seedling also has curated Party Boxes to make decorating chic and easy. 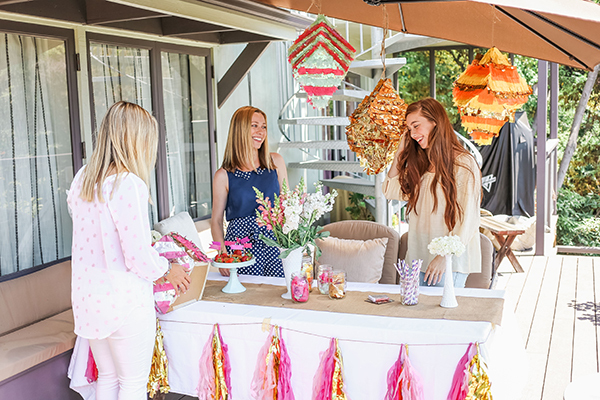 The tassel garland, burlap runner, and mini dessert flags in the photos all came from our Seedling Party Box. Other than a few vases of fresh flowers, our party didn’t need much more in the way of décor. The Seedling kit had it all! If your party was continuing into the evening hours you could also string some globe lights or light a few votives to round out the decorations. 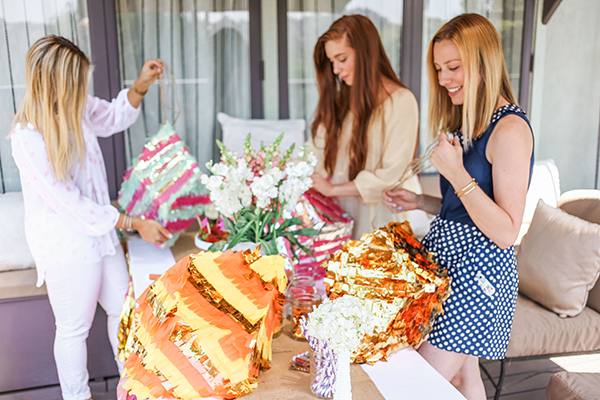 We’re big fans of parties that have an activity (or two) for guests to do. 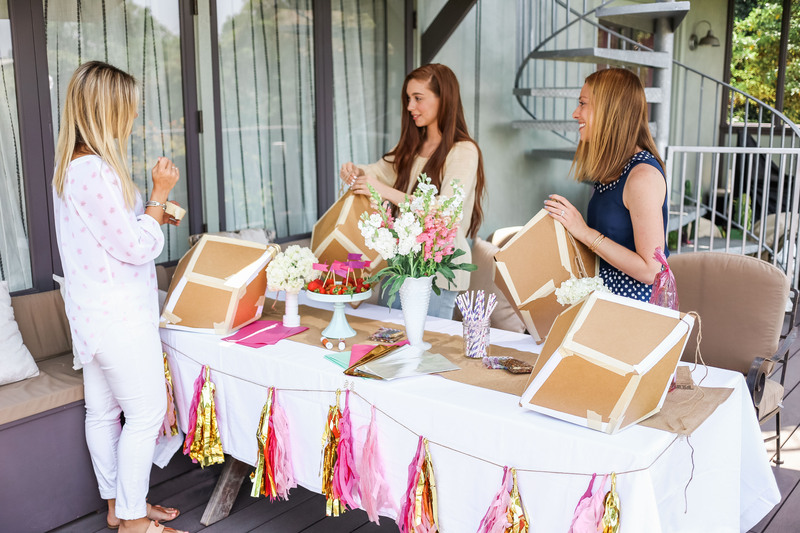 From onesie decorating at a baby shower to flower arranging at a bridal shower, we always aim to have something set out for guests to do as they mingle. This is where the Make Your Own Party Piñata kits came in for our girls’ get-together. 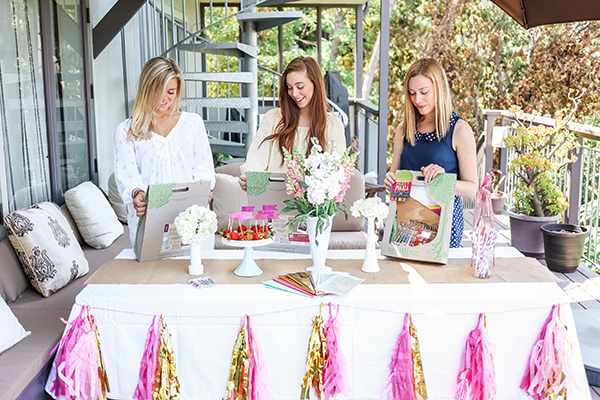 Each guest had a kit set out for her on the tablescape so that she could enjoy some crafting and get to feel like a kid again. One of the things we love best about Seedling is that while they provide you with all the necessary supplies, they encourage you to customize your craft and use additional materials you might already have at home. Thinking outside the (activity kit) box and using your imagination are some of their key values. 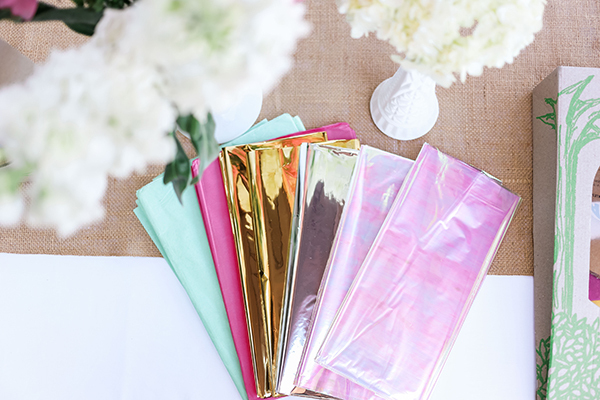 With this in mind, we chose to supplement our kits with some metallic and iridescent tissue. All of our piñatas turned out so beautifully, and they were all unique. Even with that one kit, the options are limitless. Finger food and bite-sized treats are always our go-to for parties since they’re easy to easy to eat while mingling or taking part in an activity. Fresh summer berries and mini cookies were perfect for our afternoon gathering. You could also serve a selection of nostalgic, summer-camp themed bites like s’mores, trail mix, and pigs in a blanket. 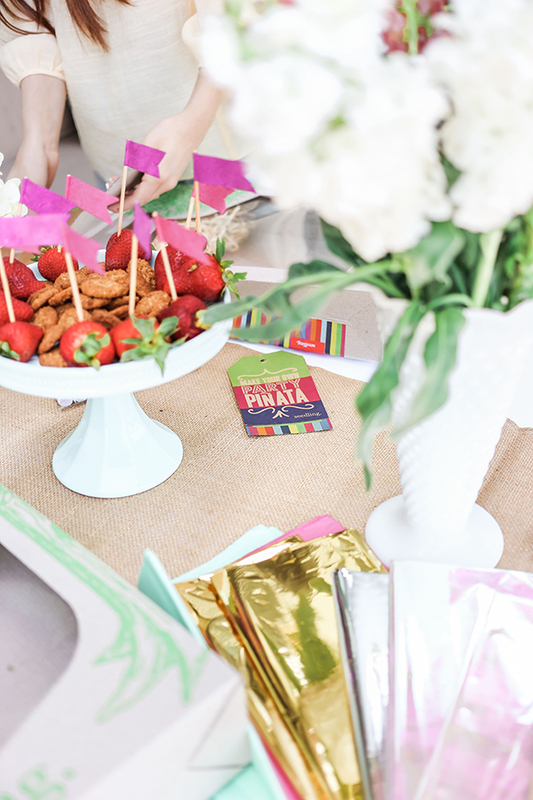 We set our snacks upon a cake stand and stuck the adorable mini flags from our Seedling Party Box into the strawberries. There you have it! 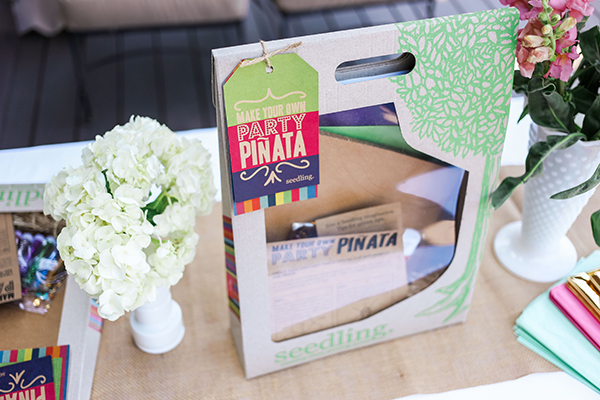 We had such a fun time at our summer soirée and we hope you use our tips to throw a piñata making party of your own… which is why we’re so excited to share that Seedling is offering a chance to win everything you need to host your own piñata making party (5 Make Your Own Party Piñata kits and a Party Box)! UPDATE: Congrats to our winner littlesouschef! Check your Instagram direct messages to claim your prize. Click on over to Seedling’s website and take a peek at all of their fun activity kits and other products. 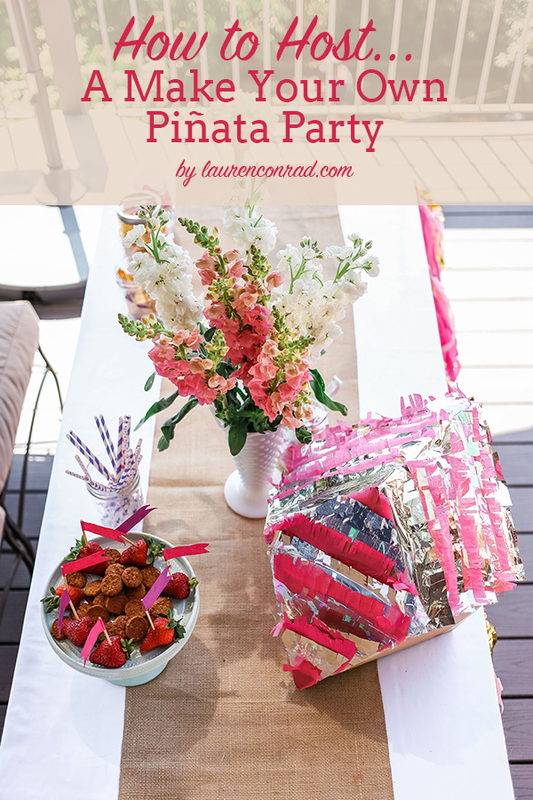 Leave a comment below letting us know how you’d plan your piñata party. Make sure to leave your Instagram or Twitter handle with your comment so we can contact you if you win. We’ll pick one winner at random and announce them on the site on Monday, June 29th, so make sure to check back! Which other kit from Seedling would you like to try? Do you have any little ones in your life who you know would love Seedling? If you’d like to try another kit from Seedling, you can use our exclusive discount code for LaurenConrad.com readers! Use the code CONRAD40 at checkout to receive 40 percent off your order from now until July 6th. • this contest is open to us residents only. sorry international fans! • winners will be contacted via comments and Instagram/twitter. if our team does not hear from you within 24 hours, a new winner will be selected in your place. • this giveaway ends at midnight pst on sunday, June 28th.